Fikret Orman (center) poses with Nicolas Isimat-Mirin (left), Shinji Kagawa (second left), Muhayer Oktay (right) and Burak Yılmaz (second right) at a ceremony in Istanbul, Feb. 5, 2019. Two years after its last league title, Beşiktaş, a powerhouse of Turkish football, is looking for more success in the Super League, where it is currently sitting in third place. The Black Eagles boosted their lineup with four transfers in the midseason and showed them off yesterday in an official signing ceremony in its splendid Vodafone Park. 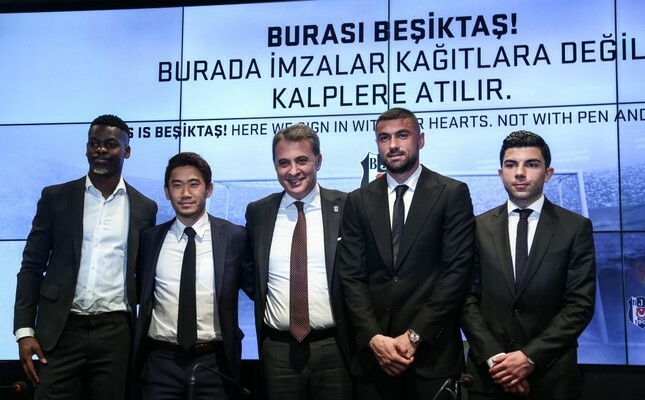 New transfers Shinji Kagawa, Burak Yılmaz, Nicolas Isimat-Mirin and Muhayer Oktay joined club Chairman Fikret Orman for the ceremony, which an army of local and foreign journalists covered. "We hope for a happy second half for fans. We went through difficult times and parted ways with some players," Orman said before detailing how they juggled the payments for the new transfers in the face of mounting debts. "We looked at how we can avoid paying money to clubs of players we transferred. We spent about 1.5 million euros [$1.71 million] but earned 5 million euros from players we parted ways with. Beşiktaş now has a younger team," Orman said. Kagawa was the undisputed star of the ceremony that was held two days after the Japanese midfielder's debut that wooed fans. The former Borussia Dortmund player, who arrived in Beşiktaş on loan, came off the bench late in the second half in a game against Antalyaspor and scored two goals in three minutes. "I am really happy to be here. Everyone was very welcoming. I'll do my best to help the team climb to the top," Kagawa said at the ceremony before heaping praise on the city of Istanbul and Turkish cuisine. "We have a great atmosphere here in Vodafone Park," he added. Kagawa, who visited his compatriot Yuto Nagatomo who plays for Beşiktaş' archrival Galatasaray, said he was looking forward to the upcoming Beşiktaş-Galatasaray derby. He said his debut with Beşiktaş was "dreamy," but what mattered now was doing better. "Two goals in three minutes was really surprising for me. I want to do more for Beşiktaş," he said. Fikret Orman said they had planned to hire Kagawa before the first half, but they couldn't despite repeated calls by Beşiktaş fans. "His transfer also made waves in Japan and in Asia. Our interest in Asian players will not be limited to Kagawa. We are considering a new strategy regarding the transfer of players from the Far East and want to make Beşiktaş more known there," he said. Orman said Beşiktaş' matches are now being broadcast live in Japan, and they hoped there would be changes to the match schedule, pointing out the vast time zone difference between Turkey and Japan. Turkish media outlets reported yesterday that a company with broadcasting rights for Turkish teams in Japan sought a change in the match schedule, especially for the games of Galatasaray and Beşiktaş.